Ted Cruz is despised by Senate Republicans: A list of the reasons GOP senators hate the junior senator from Texas. There’s more than one reason they despise the junior senator from Texas. 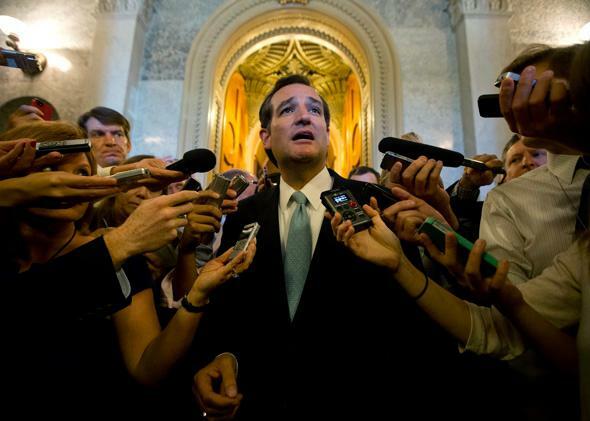 Ted Cruz did not win any popularity contests in the Senate this week. At one point in the tense back and forth between Sen. Ted Cruz and Sen. Bob Corker this week, the Senate’s presiding officer, Sen. Tammy Baldwin of Wisconsin, had to remind these two Republican colleagues that “senators are to refer to each other in the third person and not by name.” This quaint rule is to keep the disagreements from getting personal. As the late Sen. Robert Byrd once put it: “It is difficult to project the image of a statesmanlike, intelligent, public servant, attempting to inform the public and examine issues, if one is behaving and speaking in a manner more appropriate to a pool room brawl than to United States Senate debate.” In keeping with that sense of civility—in which members refer to each other as “my good friend” when they mean “that craven charlatan”—I will characterize my reporting on the views of many of Cruz’s Republican colleagues in a similarly circuitous manner: Their affection for him this week became so qualified as to be indistinguishable from hatred. They don’t keep Senate records about this kind of thing, but it’s likely that no senator has created as many enemies in his party in as short a time as the junior senator from Texas. Sen. Cruz hasn’t been content to stop there. After angering his fellow GOP senators for days, he capped the week off by making fewer friends in the House. As Robert Costa of the National Review first reported, just as House Speaker John Boehner was cobbling together support for a measure to fund the government, Cruz advised Tea Party conservatives not to support him and they took his advice. Jealousy: In a matter of months, Cruz has built a base of support that allowed him to act as the de facto Republican leader of the Senate. He wasted precious time: Republicans don’t want to get the blame for a government shutdown. By soaking up valuable Senate time with no-win maneuvers, Cruz has left House leaders with less time to follow their legislative strategy—one that might have won limited concessions from the White House. Or, with significantly more time, House Speaker Boehner might have been able to produce a funding bill that would have at least included a one-year delay of the Affordable Care Act. That would have put Democrats up for re-election in vulnerable states in a tough spot; at the very least, red state Democrats would have had to take an unpopular vote. Now the GOP looks fractured, time is short, and Boehner may only be able to pass the funding bill passed by the Senate Democrats—which he’ll almost certainly have to do with Democratic votes, offering even more leverage to the enemy. This is a pretty long list, and may not include everything I’ve heard this week. But there may be one more: The very fact that Sen. Cruz is despised by his Republican colleagues has only made him more popular among his fans.